When Dexter was 2 weeks old, I had a Groupon discount for a studio photography session for a disc of 10 digital, retouched images. It was a really good deal and the photographer did decent work, but in hind sight, I feel that Dexter came out looking kinda... weird. Since then I have paid for a photo session of our entire family (this time in an outdoor setting), and again, I feel like most of the images didn't have us looking our best. Maybe I'm just super picky or there wasn't enough time to get our kid in the best of moods. 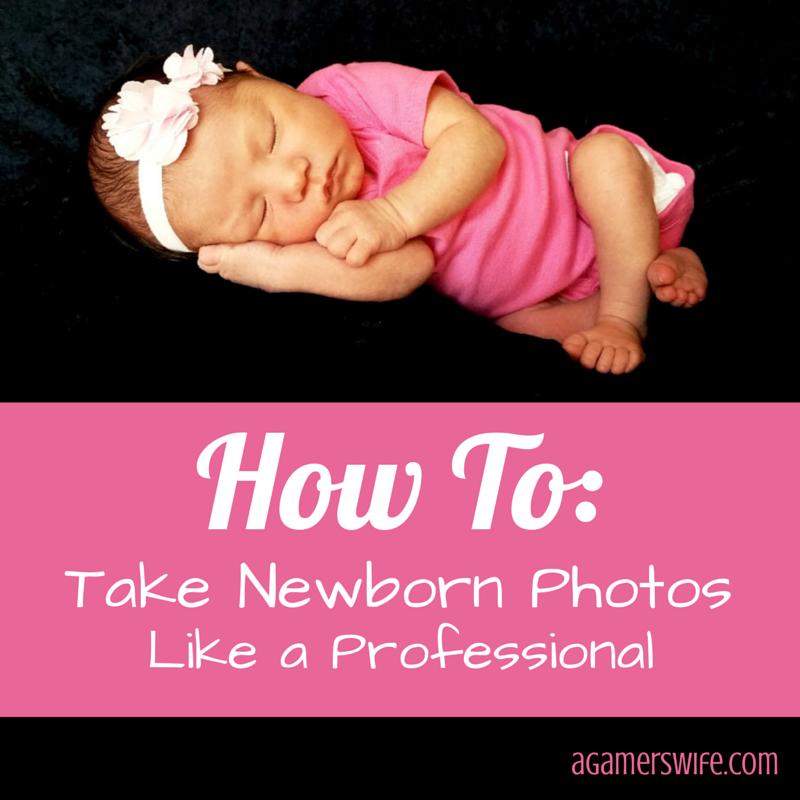 Then I saw this article on DIY newborn photography. Wow, if I could make my own setup at home and take pictures over the course of many days to get that perfect pose, maybe I could produce results that looked professional (and several hundred dollars cheaper). The only things I had to buy were a 4' x 4' smooth particle board (e.g., MDF or something similar) from Home Depot and 3 yards of cheap, black stretchy velvet (yay for 50% off coupons at Joann's). If you want, you can paint both sides of the board in solid colors or buy additional fabric as different backdrop options. As for baby accessories, I had been gifted some headbands, cute onesies, and a beautiful crochet cape made by my grandmother. I also knitted a small beanie that felt a little out-of-place in this hot, summer weather. Find a bright sunny window (ideally it should reach the floor for maximum light) and place the board at a 45 degree angle about 6 or more feet away so that the sunlight doesn't directly hit it and there is enough room for the photographer to sit in front. Prop up the board with a sturdy chair with a high back. In front of the board, place the ottoman with the Boppy pillow on top. For those lovely naked baby poses, cover the pillow with your waterproof pad or plastic garbage bag and then an absorbent bath towel. Finally, clamp the backdrop fabric to the top and sides of the board and drape the rest of the cloth over the ottoman setup. Try to smooth out as many wrinkles as possible. Now you're ready for baby! I shot our photos in front of our full-length back door windows from 2-4 pm, when it was very bright overall but there were no window-shaped sunbeams shining directly on the subject. 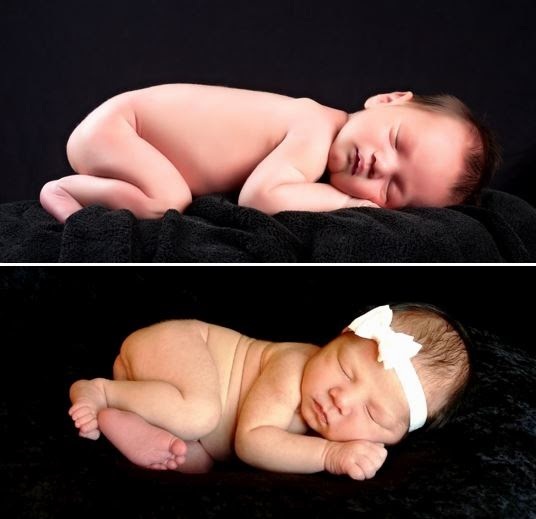 Try to take the pictures within the first two weeks of baby's life since newborns grow so quickly. Plus, infant acne tends to occur soon afterward, and I'm not good enough at photo editing to eliminate them completely. Fold her hands underneath her head so they don't block her face. If a hand is in the frame, try to get all of her fingers showing (which I wasn't great at doing). Tuck her legs underneath her so they don't look too gangly and awkward. 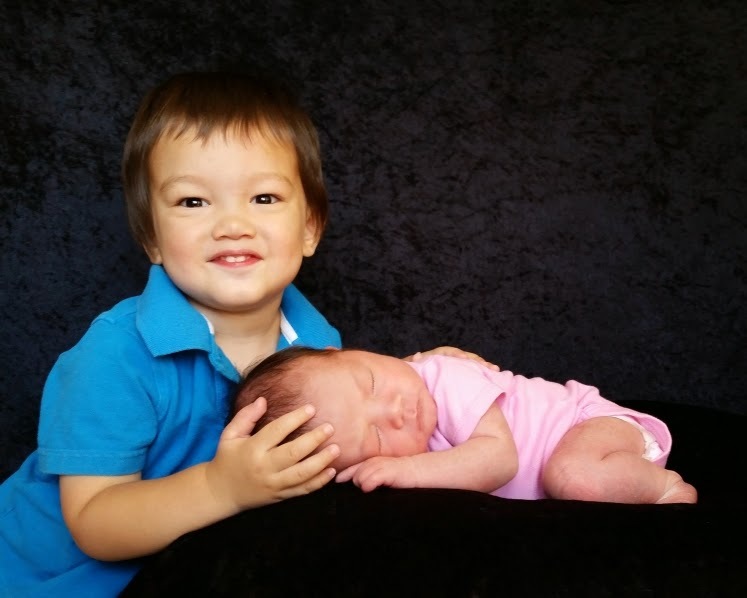 When posing baby with a family member, try to put your face very close to the newborn for increased intimacy. Don't aim the camera up her nose; angle it slightly from the top of her head for a more flattering shot. It also looks better if baby's eyes are completely closed. 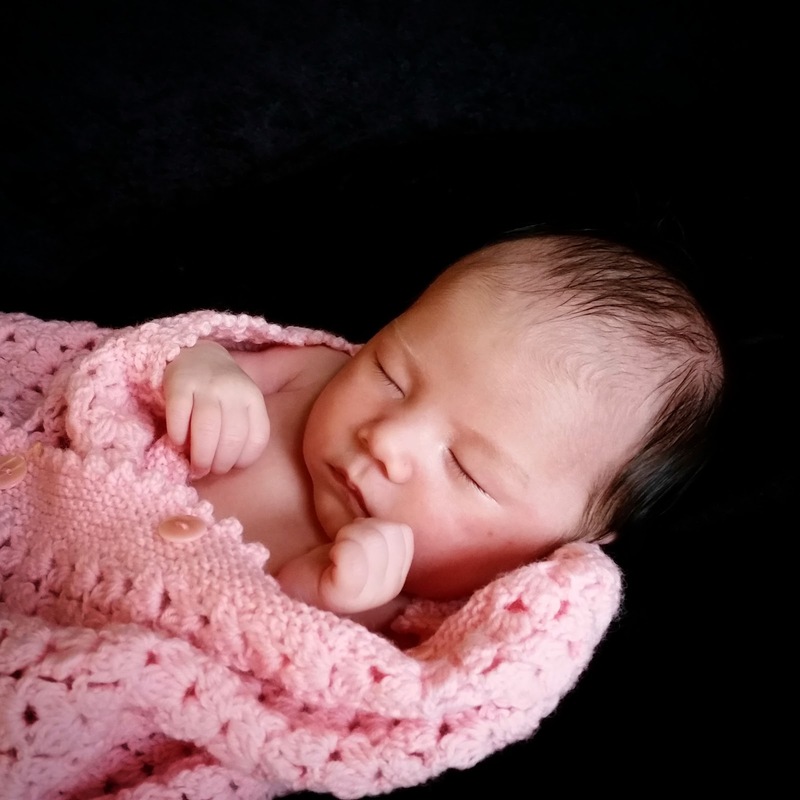 In general, you want baby to appear as small, compact, and cute as possible. If she starts to wake, pause and start patting her back and shushing in her ear until she falls asleep again. 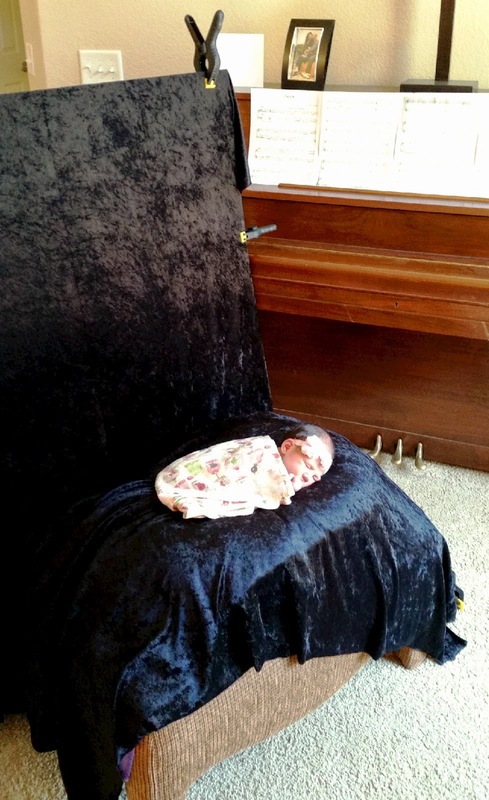 It also helps to keep the room warm and to cover your newborn with a blanket until you're ready to shoot. Take many, many, many shots per pose! You may think they all look the same, but trust me, you'll regret it if your favorite shot is just slightly blurry and ruined. I wish I had taken a lot more shots during the brother-sister session because it was unbelievably difficult to get my 2-year-old son to stay still. This was the only semi-nice picture that came out. I had a tough time getting Rosalina perfectly posed like the Pinterest posts I so admired. You know what I'm talking about: the "wedding rings on toes/fingers," the "hands behind head with legs crossed," and of course the elusive "chin perched on hands." It seems that any position I did besides a plain ol' "on her back" or "on her stomach" resulted in a cranky newborn rudely awoken from her nap, but I attribute that to my inexperience. Generally, I only got about one to two poses per day before she because overstimulated and uncooperative. You can definitely try to get some nice photos while they're awake, but alert babies tend to move around a lot if they're not swaddled. Oh, and don't even get me started on the naked photos! As cute as they may be, they are a pain to clean up. Just expect that your baby will pee almost immediately and frequently. After two consecutive days of doing laundry because my only backdrop fabric kept getting filthy, I resigned myself to leaving a diaper on her at all times and covering her with a decorative blanket from waist down to hide it. In this shot, we were able to fake the "naked newborn" look because my husband's hands were big enough to cover baby's diaper. The last step to getting professional-looking photos is post-processing it with some kind of photo-editing software like Adobe Photoshop. They have a free version online called Photoshop Express Editor that is super easy to use for beginners, but it unfortunately compresses pictures and saves them in a low-resolution version. As a PC user, I use a combination of free software like paint.net and Windows Photo Gallery. I'm by no means an editing expert, but there are plenty of online tutorials for whatever your tool of choice. I hope you found this article helpful. Please comment with any favorite photo editing software or tutorial sites you like to use!